Placed next to your favorite chair or at the end of your living room sofa, this round end table will always come in handy. Complete with a smooth top and matching lower shelf, this item offers ample surface area for holding all your loose household items while lounging on the couch. Small enough to fit in nearly any corner of the room, you can't go wrong with this functional addition to your home. Casually styled with poplar solids and ash veneers covered in a medium brown finish, this piece will bring warmth and relaxation to any room in your home. Versatile in function and style, this end table is the perfect home accessory. The Concierge Round End Table with Lower Shelf by Hammary at Jordan's Home Furnishings in the New Minas, Halifax, and Canning, Nova Scotia area. Product availability may vary. Contact us for the most current availability on this product. Modern lifestyles deserve the effortless style of the Concierge Collection. 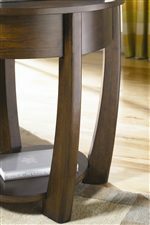 Shapely frames are paired with an inviting finish to create a contemporary group of occasional tables. 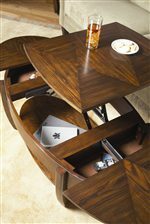 A cocktail table with a lifting top, along with shelves and drawers in the end table and sofa table, offer convenient and functional storage solutions without compromising the group's trendy style and graceful appeal. Combine this collection of accent tables to create a modern living room with versatile benefits and fashionable displays. The Concierge Collection will turn your living room into your favorite room. The Concierge collection is a great option if you are looking for Contemporary furniture in the New Minas, Halifax, and Canning, Nova Scotia area. Browse other items in the Concierge collection from Jordan's Home Furnishings in the New Minas, Halifax, and Canning, Nova Scotia area.